I think this is an appropriate posting on the day of Nelson Mandela’s State Funeral. Being ex South African, having worked for 2 years as a doctor at Baragwanath Hospital, in the middle of Soweto, I have a deep understanding of these issues. Mbeki and his government believed you could treat AIDS with herbs and other Black Magic, with the usual anti-western stance, and all western medicine is bad attitude. It took a man of Mandela’s stature to stand up and be counted. By the way, Mandela was a graduate of my old alma mater, the University of Witwatersrand. Soweto has the only street in the world that had 2 Nobel Prize winners living there- Mandela and Bishop Desmond Tutu. James McIntyre is Executive Director of the Anova Health Institute James McIntyre does not work for, consult to, own shares in or receive funding from any company or organisation that would benefit from this article, and has no other relevant affiliations. Glenda Gray does not work for, consult to, own shares in or receive funding from any company or organisation that would benefit from this article, and has no relevant affiliations. In the past few days since the passing of Nelson Mandela, the father of the South African nation, it has become apparent just how much Madiba meant not only to us, but to the rest of the world. He is a part of all our lives, and his humanity has touched us all. For those of us working in the field of HIV, this was embodied by his stance on the inaction of our government as HIV exploded in South Africa. Although Mandela had acknowledged the looming threat of AIDS in 1992, during his years as the first president of the new South Africa after 1994, he admitted that he had not paid attention to the new epidemic that was unfolding in the country – something he later lamented. Under the leadership of the next president, Thabo Mbeki, our work in HIV became increasingly difficult. We were leading local research on the prevention of mother-to-child transmission of HIV in Soweto, but research findings weren’t being implemented. Where once we had had a warm relationship with the Department of Health, we became increasingly maligned. The special committee set up to advise the department on HIV and AIDS was disbanded, and the department refused to embrace affordable interventions to prevent mother-to-child transmission of HIV. All of this was happening against a background of a growing presence of AIDS denialism in the corridors of power, which culminated in the “Presidential International Panel of scientists on HIV/AIDS in South Africa”, where Mbeki invited a number of dissident scientists to debate the the so-called “orthodoxy” about the etiology of AIDS. In Mbeki’s opening address at the International AIDS Conference in 2000 in Durban, he again reiterated his doubts about the gravity of the epidemic. In contrast, Mandela was becoming increasingly vocal about the AIDS matter in South Africa. It was Mandela who gave the closing speech at the very same conference, in which he said that the dispute over the cause of AIDS was “distracting from the real life-and-death issues we are confronted with”. Later he became even more direct in public, and accused Mbeki of dereliction of duty for not leading the fight against HIV. He began lambasting the government for not providing anti-retrovirals and told a newspaper: “This is a war. It has killed more people than has been the case in all previous wars and in all previous natural disasters … We must not continue to be debating, to be arguing, when people are dying”. Mandela began to increasingly use his presence and influence to counter the Mbeki administration’s denialism. In 2001, he celebrated his birthday on a freezing winter day at Baragwanath hospital with children from our clinic. A few months later, in February 2002, we were awarded the Nelson Mandela Health and Human Rights Award for pioneering work done in the field of mother-to-child transmission. This “coup de grâce” award ceremony was intended to make maximum impact and was scheduled for the day before Mbeki was due to give his annual state of the nation address to parliament. The award traditionally happened with the full support of the government, but that year the audience was thin on Mbeki’s government politicians. Mandela drew attention to the plight of mothers and babies with HIV and he spoke of the benefits of medical science, saying that debate over “some fundamental issues” about AIDS “unfortunately continues to rage in manners that detract attention from what needs to be our core concern”. The response by the Mbeki administration to Mandela’s perceived treachery was swift and vindictive, and Mandela was chastised by members of the ANC’s National Executive Committee. But his actions and words created the space for others to speak up, and helped support the fight against AIDS denialism. But, as so often with Mandela, his actions spoke even louder than his words. On arrival at the clinic, accompanied by a swarm of press photographers, he immediately asked to hold one of the children of an HIV-positive mother, and every photographer’s lens focused on him, with Carter and Gates following his example. The picture of three elderly men, each dangling a baby on their knee, with no sense of stigma or fear of HIV, flashed around the world. 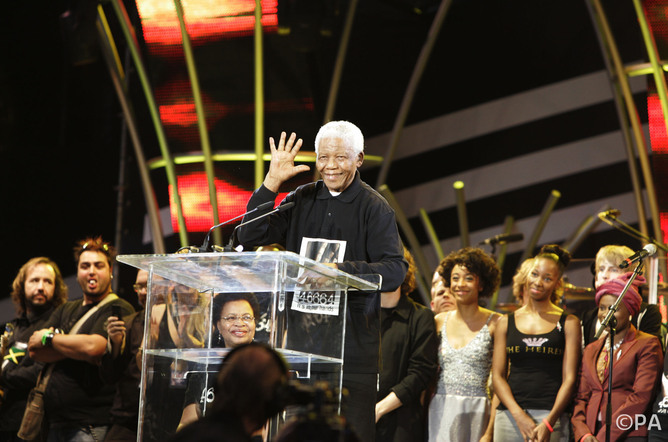 More determined, Mandela’s campaign continued, and in mid-2002 at the International AIDS Conference in Barcelona, Mandela urged world leaders to do more to reduce the stigma of HIV/AIDS. Visiting the AIDS activist Zackie Achmat later that year, he begged Achmat to start taking antiretrovirals, and famously donned a T-shirt, with the slogan “HIV POSITIVE” and was photographed in it. According to Judge Edwin Cameron, this may have been the intervening moral voice that made the change in the government’s resistance to antiretroviral drugs inevitable. Within a year, the Mbeki government had relented and committed, albeit reluctantly, to an antiretroviral treatment programme. We have no doubt that Mandela’s public support for our work on mothers and babies, and for the HIV treatment struggle in those years, changed the course of AIDS in South Africa. Without his moral authority, his unerring truthfulness and his public courage, it is unlikely that the government would have changed course and antiretrovirals would not have been available in the country for many years. But the slow change in attitude would come too late for Mandela’s son, Makgatho, who died from AIDS in 2005. But even in the face of this immense personal sadness, Mandela spoke publicly of his son’s cause of death, facing down the stigma that he knew was still evident. We were privileged to be supported by this great man, and to see his humanity and integrity in action. 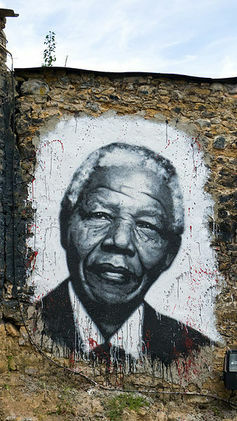 He changed our lives and the way in which we work, and he changed, yet again, the face of South Africa.